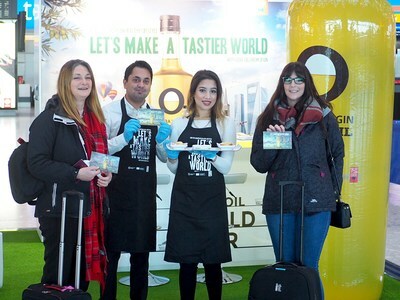 Olive Oils from Spain, and the European Union, present the first promotional action in the United Kingdom from the Let's Make a Tastier World campaign, which is touring Europe, USA and Asia. From January 15th to February 15th, the "Olive Oil Lounge" arrives at London's Heathrow airport, a space that will invite millions of travelers to discover the culture of olive oils through its oleoteca, where they can taste the best extra virgin olive oils in the world. The Olive Oil Lounge will move travelers to the heart of the Mediterranean diet, to the essence of where olive oil is born and will do so from the airport that has the highest passenger traffic in Europe (about 78 million in 2017). This airport is also the main gateway to London, a city that has experienced an impressive boom of Mediterranean cuisine and "tapas." It's the second European city that has the most Michelin stars and has consolidated an extensive range of Spanish cuisine, led by chefs such as Elena Arzak (Ametsa, with a Michelin star), David Muñoz (StreetXO), Eneko Atxa (Eneko Basque Kitchen & Bar), José Pizarro (José Tapas Bar and Pizarro restaurant) or Nacho Manzano (Ibérica London) where there is no shortage of olive oils from Spain. The consumption of olive oils has multiplied almost three times in that market in the last two decades. From 25,000 tons at the end of the last century to 71,000 tons in 2017. And it's been Olive Oils from Spain, the main drivers of this growth. Its sales have multiplied by four in 20 years. Almost 70 percent of imports originate from Spain. According to Customs of Spain, in the first nine months of the year, 34,577 tons were exported to the United Kingdom, 2.53% more than in the same period in 2017. It is Spain's fifth largest customer in the world. The Interprofessional of Spanish Olive Oil, a non-profit organization, formed in turn by all representative entities of the Spanish olive oil sector, has as its main objective the dissemination of the product throughout the world and does so through their brand Olive Oils from Spain.